Winter 2018 was spent deciding what vegetables we wanted to try, focusing again on the new or usual. Again we were tempted by South American vegetable tubers so we ordered Mashua, pronounced Mash-wa (Tropaeolum tuberosum), a perennial of the nasturtium family. As they were a little expensive, we bought just two roots and decided to plant them at either end of the plot. 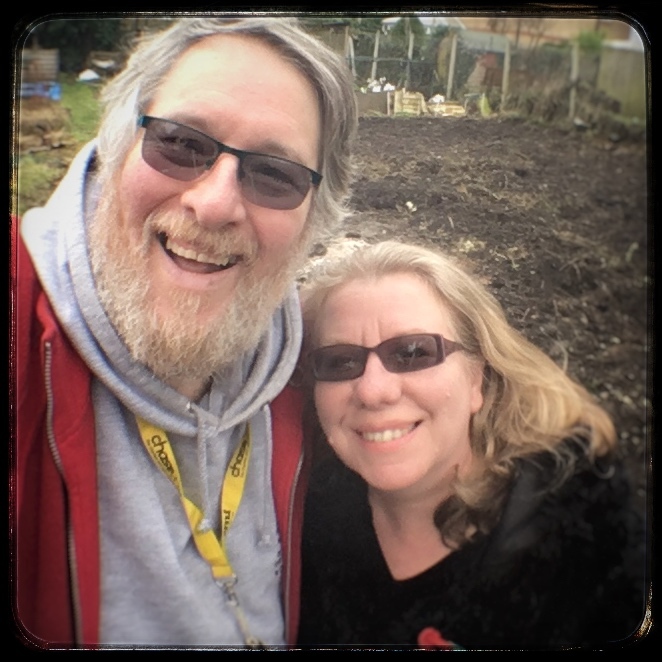 January 2017, we took over our allotment and decided that, once we’d cleared the plot and removed all the old concrete, we would create woodchip paths with a geotextile barrier underneath to help combat weed growth. We wanted clean and dry access around the plot, not least because it would be easier to get about on a mobility scooter. We decided on woodchip because maintenance is less than grass, and cats don’t tend to confuse it with their litter tray as they sometimes do with gravel. Another advantage is that, after the initial cost of the geotextile, woodchip can usually be sourced free of charge. With Burns Night looming, a visit to the plot to collect some potatoes was quickly becoming necessary. We leave our crops in the ground until we want to use them. This can increase the exposure to pests and diseases but we find they just last better this way, probably because we have a well drained sandy soil. So off to the plot on a wintry afternoon, dry but cold. The main crop potatoes we planted were Sarpo Mira – a blight resistant variety, producing quite large tubers. With the first indications that we’ve had frost on the allotment and colder weather forecast for the end of the week, we decided it was time to harvest our chillies. How did they do? As explained in an earlier post, we had acquired a number of chilli seeds and decided to trial them against each other. I would like to say that we nurtured our little seeds and gave them the best growing conditions we could, but we didn’t. Last September, the Quest for Veg were invited to Glee – a show for the garden center trade. Glee is the place where the garden industry comes together to launch its new ranges, latest innovations and next bestsellers. Over three days, 7,000 plus visitors come looking for the products that will fill the shelves of garden centres, high street stores and supermarket shelves in the season ahead.